North Brentwood, MD (December 27, 2016) – Prince George’s African American Museum and Cultural Center’s most recent exhibition, Through Their Eyes – Art, Education, and Influence, features works by some of today’s most prominent visual artists, all of whom honed their skills in the Prince George’s County CVPA (Center for Visual and Performing Arts) Programs at Suitland and Northwestern High Schools. 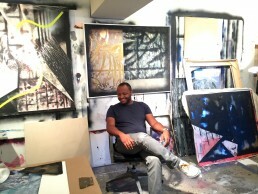 Rush Baker IV, one of the exhibition’s featured artists, is a testament to the impact of arts education in the County. As a native Prince Georgian and the son of the current County Executive, Baker is deeply connected to Prince George's past as well as its future. From his contributions as a renowned visual artist to his work as Assistant Director of the Brentwood Arts Exchange, Baker’s dedication is equal parts creativity and public service. a time for celebration of the Good, the good of life and of existence itself, the good of family, community and culture, the good of the awesome and the ordinary, in a word the good of the divine, natural and social. THE PG COUNTY YOUTH POET LAUREATE PROGRAM IS HERE! Win a book publishing deal and represent PG County across the region! HOSTED BY EZ STREET OF 93.9 WKYS!! THE PGC – YPL Program is a joint venture of Urban Word of NYC and DIALECT of PG County, along with LYRIKAL STORM, with additional collaboration by the American Poetry Museum, the PG County African American Museum and Cultural Center, ECO City Farms, and the Prince George’s County Social Innovation Fund, with generous support from county residents like you. From October 19th till November 16th, online submissions were accepted at www.dialect-usa.com from county residents ages 14-19 who are poets, rappers, youth leaders and activists interested in representing PG County abroad. A panel of esteemed judges will select 12 finalists to be given the distinction of Youth Poet Ambassador for PG County, and one teen will be honored with the title of PG County Youth Poet Laureate. Along with winning the prestigious title of Poet Laureate, the winning poet will also win a book deal from Penmanship Books to publish their first collection of poems, as well as a reading tour. The Laureate and County Ambassadors will have numerous opportunities and platforms to share their talent and energy at various events across the DC Metro area. Urban Word and their partners recognize that youth voice and community engagement are vital for empowering young people to create lasting change in their immediate and global communities. Local and national partners include Youth Speaks, PG Parks and Recreation, and Penmanship Publishing. The Prince George's African-American Museum & Cultural Center at North Brentwood, Inc., in partnership with the Prince George's County African American Genealogical Society and the Prince George's County Memorial Library System, presents Finding Your Historical and Genealogical Roots, a series of workshops focusing on the fundamentals of African-American historical and genealogical research. The sessions will provide the attendees with a step-by-step "how to" guide to in tracing African-American lineage. They will show participants how to identify sources, records, and other tools needed to organize and manage research materials. Activities will include surfing genealogical websites on the Internet, preparing for a research trip, developing a family tree, conducting oral interviews, understanding DNA testing, planning family reunions, unlocking the mysteries of genealogy for children, etc. Tuesday, August 25, 2015, 7:00 p.m. - 8:30 p.m.
Tracing your family's history is a fascinating journey. The instructor will guide the participants along the way by offering how-to articles, genealogy classes, and other resources, e.g., newspapers/yearbooks, obituaries, funeral records and programs, bibles/diaries, organization records (fraternities, sororities, companies, clubs) that will help them dig deeper into their families' past. Saturday, September 26, 2015, 2:00 p.m. - 3:30 p.m. The instructor of this workshop will provide the participants with the basics of planning a family reunion. The most successful reunions begin with a spirit of inclusion and cooperation. The planning process will help determine what works best for the family. The participants will learn to create the family reunion budget, plan, activities, and develop recruiting strategies. The goal is to make the family reunion a memorable and fun experience for all. Saturday, October 24, 2015, 2:00 p.m. - 3:30 p.m.
As history comes alive, this workshop will inspire children to search for their ancestors. Children can unlock the mysteries of other cultures, places, and times as they look for their families - when they were born, where they lived, and what they did to survive. The hands-on learning that a project brings to the classroom can help motivate students to learn, as well as encourage retention of the covered material. Family history can be used to teach not only history, but also language arts, writing, math, geography, and even science. Family history projects can also be used to teach and encourage communication, information-gathering, research, computer, analysis, and evaluation skills. It is also an excellent method for encouraging the acceptance of individual differences. For more information, please contact the Largo Kettering Library at (301) 336-4044. The Prince George’s African-American Museum & Cultural Center at North Brentwood, Inc., in partnership with the Prince George’s County African American Genealogical Society and the Prince George’s County Memorial Library System, presents Finding Your Historical and Genealogical Roots, a series of workshops focusing on the fundamentals of African-American historical and genealogical research. The sessions will provide the attendees with a step-by-step “how to” guide to in tracing African-American lineage. They will show participants how to identify sources, records, and other tools needed to organize and manage research materials. Activities will include surfing genealogical websites on the Internet, preparing for a research trip, developing a family tree, conducting oral interviews, understanding DNA testing, planning family reunions, unlocking the mysteries of genealogy for children, etc. This series of workshops will teach participants the fundamentals of African-American historical and genealogical research. The sessions will provide the attendees with a step-by-step “how to” into tracing African-American lineage. They will show participants how to identify sources, records, and other tools needed to organize and manage research materials.